For those of our readers who enjoyed Strong Bad episode 1, you will no doubt be itching to hear more about episode 2 in the series ‘Strong Badia the Free’. Worry not today we can reveal 8 new images and the official trailer for the second installment. When Strong Bad fails to obey the King of Town's totally unfair email tax, he's placed under house arrest. Once freed from his wrongful imprisonment, Strong Bad goes on a mission to unite the local warring factions under the Strong Badian flag. Is Free Country USA ready for such an awesome ruler? Strong Badia the Free will be available on WiiWare sometime in September. Watch this space for the latest Strong Bad news. i'll be in the minority but i just don't want to play any of the strong bad games. i was never familar with the homerunner cartoon online. You get to go to Strong Sad's room in the next episode! I doubt hes really dead though. Its in the 1st screenshot, you just see a picture of homestar on the floor, so hes either dead or done something good. Yes, but by doing this WWW is able to spread out the limited SBCG4AP advertising material and generate more interest in the ongoing series. @Ian: Yeah, you're right. Though, a new trailer would have been nice. I don't know if it's because I've only been watching the older cartoons of Homestar but their voices sounded kind of off in this trailer. Is this that problem that they said was credited to Flash having different audio filters than what they use for video games? cant say ive been interested or even tempted to get the first one but be good for people who really like it, just doesnt seem worth it to me. I still have to get the first one as well, since I can't free up any blocks at the moment (grrrr). Don't care about this absolut mess. I have the first episode and it's the worst graphic adventure since , well, ever. 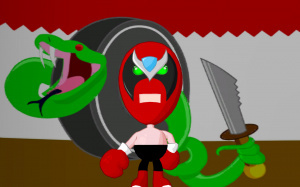 I want point n click, but I'm not sure about Strongbad. Anyone played the Wii version of Sam & Max? Is it any good? The Wii version of Sam and Max isnt even out yet! @Wariofan Yeah thats the Telltale game I want. I may get this for PC though. My friend got it and it seemed decent, even if Strongbad gets alil annoying after the first hour. HAHA, word, I saw it on gamespot or something nearly a year back, figured it was out by now. it looks like Strong Sad is going to have a bigger part in this. Oh, and I recommend just deleting the first episode once the next one comes out. I just noticed that the photo in one of the screenshots is of Colonel Homestar Runner! Awesome! The Homestarmy is great! GameInformer only gave the Wii Sam and Max a 7/10 or something. So, I'd say it's probably average depending on who's playing it. "You get to go to Strong Sad's room in the next episode!" You can go into Strong Sad's room in episode 1 too. You just have to do one little thing that most of us most likely skipped: play the tutorial! "In Strong Sad's room there was a open door, which either looked like a shower or another room..."
Edit: Having actually looked at the screenshots now... Yes, that appears to be the closed door I mentioned, opened up to reveal a bathroom.